Farm-fresh eggs can be difficult to use for hard-boiled eggs. Most eggs on the shelves at the grocer store are weeks old, which is good for hard-boiling but no so good if you like fresh eggs. 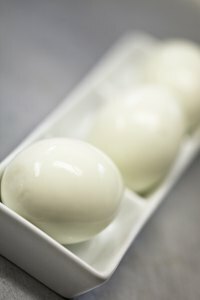 As the egg ages, it shrinks inside the shell, which makes it easier to peel after boiling. Fresh eggs fill their shells, which can make them difficult to peel. The secret to having fresh eggs and boiling them, too, is to find a way to shrink the egg within the shell so it can be peeled more easily. Arrange the fresh eggs in a pot and add water until they are covered. Put a lid on the pot and bring the eggs to a rolling boil. Boil 2 to 3 minutes and then turn off the heat. Leave the pot on the stove about 1 hour. Dump out the hot water and add enough cold water to cover the eggs. Let them soak another hour. Drain the warm water and fill the pot again with cold water. Put the pot of water and eggs in the refrigerator overnight. The eggs will be ready for peeling the next day. Crack the eggs on both ends and then roll the middle of the egg on a hard flat surface several times. Make sure the majority of the shell is cracked into small pieces. Find an opening in the shell and start peeling. The shell should be very easy to remove. You can remove the eggs from the refrigerator after a few hours, but the results won't be the same as leaving them overnight.